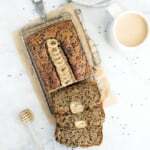 Healthy chai banana bread that will have your house smelling cozy and delicious. Topped with a simple cashew butter vanilla glaze! Life has gotten incredibly busy lately, so I must apologize for being few and far between when it comes to posting on the blog. The wedding is about two months away and we’ve still got SO much to do (ummm I haven’t gotten Tony’s ring yet). Also it doesn’t help that all I want to do is BAKE and cook all the cozy wonderful things like soup, pumpkin bread, apple butter and cookies. Food distracts me. 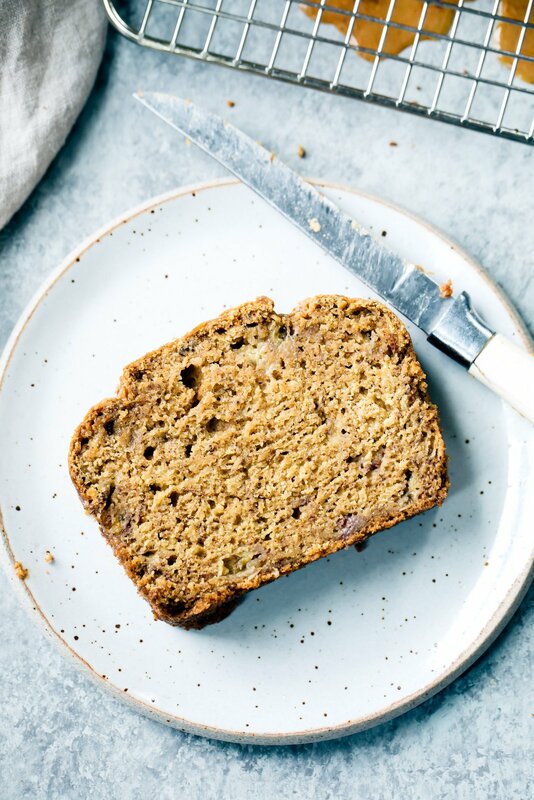 Here’s an example of me being distracted from wedding planning: Last Friday, Abra and I came back after a day of video shooting and noticed three ripe bananas on the stovetop begging to be mashed and transformed into a wonderful banana bread. 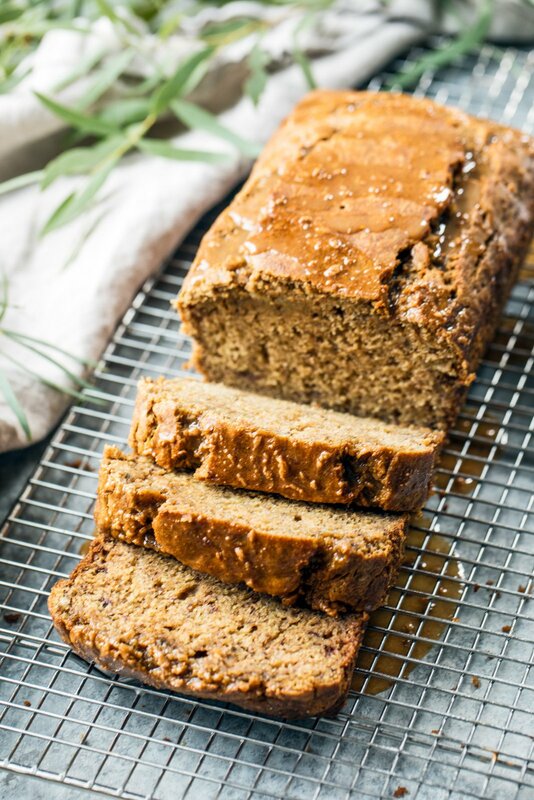 Since Abra loves all things chai, I decided to make a healthy chai banana bread made with whole grains and naturally sweetened with pure maple syrup. The loaf baked up more beautiful then you could imagine (you’ll see yourself when you bake it) and the aroma of the spices drifted throughout my house, leaving me with a grateful smile on my face and a happy heart. Abra was happy too — that’s the most important. Of course, it wasn’t just enough to bake up the loaf. 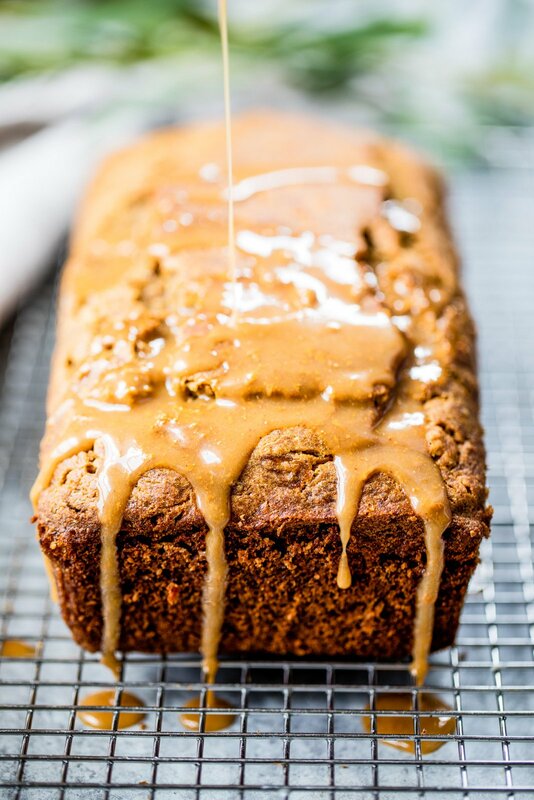 I peeked into my cupboard, noticed cashew butter and got giddy about glazing this beautiful chai loaf with a simple, yet incredibly sweet and salty cashew vanilla glaze (trust me, it’s SOOOO dang good). I love this bread for all sorts of reasons, but mostly because it’s really easy to make and whip up whenever you are in need of a quick loaf. Personally I think the additional of chopped nuts in the bread would be delicious, but it’s up to you. If you make this bread, be sure to leave a comment below and rate the recipe! Or upload a photo to Instagram and tag #ambitiouskitchen. xo! 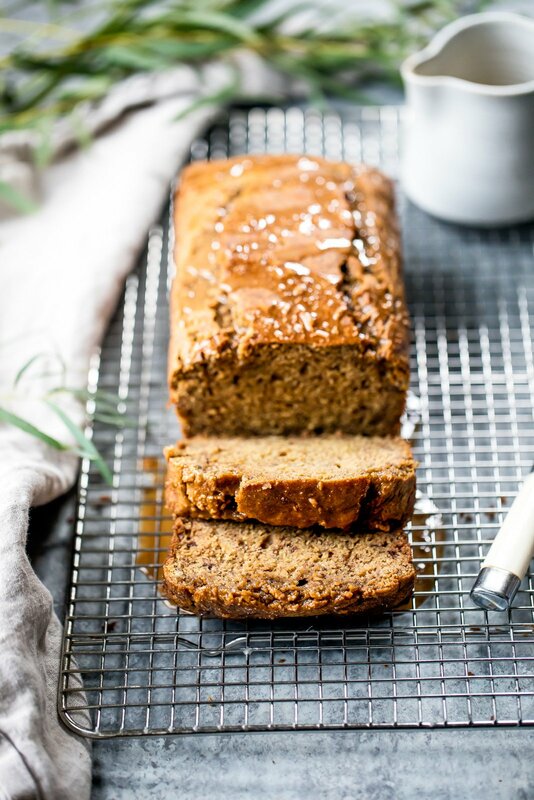 Healthy chai banana bread that will have your house smelling cozy and delicious. Topped with a simple cashew vanilla glaze! Preheat oven to 350 degrees F. Line a 8x4 or 9x5 inch pan with parchment paper and grease the inside of the pan to prevent sticking. Add mashed banana, eggs, coconut oil, maple syrup, cashew milk and vanilla extract to a large bowl; mix until well combined and smooth. Next add in the dry ingredients: whole wheat pastry flour, baking soda, cinnamon, cardamom, ginger, allspice, ground cloves and salt. Mix until just combined and no pockets of flour remain. At this point you can fold in 1/2 cup of the nuts if you are using them. Pour batter into prepared pan. Bake for 45-60 minutes or until a tester inserted into the middle comes out clean or with just a few crumbs attached. Allow bread to cool in the pan for 10 minutes, then remove and transfer to a wire rack to finish cooling. In a small bowl mix together powdered sugar, cashew butter, vanilla extract and cashew milk until smooth. Pour over bread, then sprinkle the top with a little sea salt. 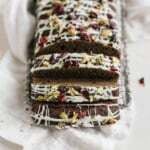 Cut into 12 slices and enjoy! To make into muffins: Line a 12 cup muffin tin with muffin liners. Bake for 18-25 minutes or until tester comes out clean. 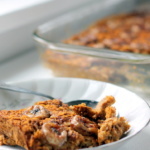 36 Responses to "Healthy Chai Banana Bread with Salted Cashew Butter Vanilla Glaze"
Looks delish! Can this be made gluten free with plain gluten free flour or buckwheat? Hi Payton! I’ve actually only made this recipe with whole wheat pastry flour, as the other gluten free flours will really change the texture of this loaf. 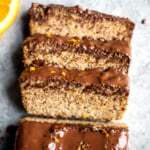 I have a few gluten free banana breads that you can add the “chai” spices and drizzle! 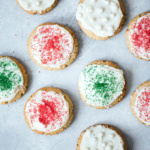 This one uses coconut flour, and this uses chickpea flour. Do you think the cashew butter in the glaze could be subbed with almond butter? This looks delicious! 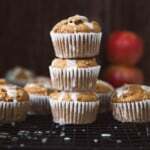 What are your thoughts on using a spouted Spelt flour substitute? I love your blog and recipes!! I haven’t tried it in this recipe so I’m not sure if the consistency would be quite the same. Thanks Maria! This sounds amazing! Could a “chai spice” mix be substituted for all of the individual spices? If so, what measurement would you suggest? Thanks! Hi Emily! You bet – if you have a spice that is “chai” flavored I would use about 3 – 3 1/2 teaspoons of it in here. Fantastic, thank you so much for your quick response! Making this weekend! Hi Monique! this looks divine, and cant wake for the wonderful aroma as well when baking. Wanted to inquire about use a flax egg. Do you think it will still hold up as well? Looking forward to making it this weekend, esp now that fall is almost here 🙂 Congrats again on your upcoming wedding, youre going to make a beautiful bride! Looking so yummy. I must try to make this. 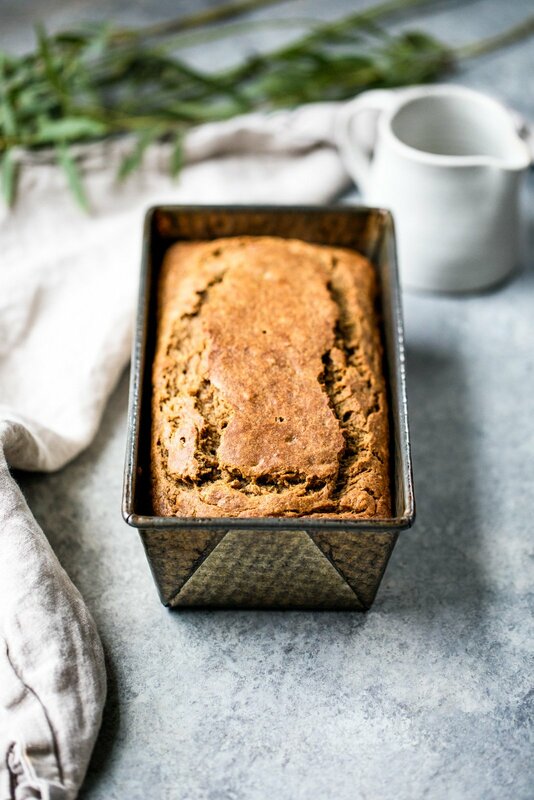 Oh my goodness, I’ve never made Chai bread and now this is on my list to make this fall!! I definitely want to try this recipe. However, I would not use wheat flour at all. I don’t consider wheat flour to be healthy. As others have suggested, I would use another flour like oat flour, spelt, etc. even if it does change the consistency. Thanks for the recipe! You bet! I like using whole wheat products as they provide extra fiber, vitamins & minerals, and actually help reduce that spike in blood sugar that traditional, processed flours can cause. It’s a personal preference! Thanks for the recipe mate. Really appreciate the effort you put into the article. Never actually tried chai banana bread, but it sounds delicious! I’m not huge on chai, but I do like the flavor! This loaf looks soooo delicious too. Definitely want to try baking with chai sometime! Amazing! I hope you enjoyed! I made this for the first time last night and I absolutely love it! I followed the recipe to the tee, and it turned out beautifully! Thanks so much for sharing! So great to hear, Argie! One of my favorite banana breads. Glad you enjoyed! Cleaned out my freezers to find about 9 frozen bananas, so I made two loaves of this and another of a different banana bread. Sooo yummy. I subbed almond butter for cashew just because it’s what I had. It’s super yummy. I’ll be curious to see how it is tomorrow. Not sure if I overbaked it or not. I baked it 55 min. And even if I did overtake a bit, it’s nothing a little warming up and a smudge of butter can’t help! this is good receipe.Batter tastes delicious food.